David Hockney was born in Bradford on the 9th July 1937. This English painter lives in Bridlington, Yorkshire. As a multi-talented artist, he is a draughtsman, printmaker, stage designer and photographer. 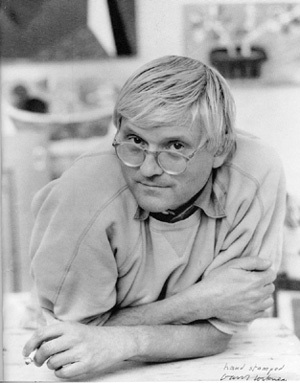 He is also well-known for his important contribution to the Pop art movement which took place in the 60’s, characterized by its critical view on mass industrial consumption. Still being a young student, he took part in an exhibition called Young Contemporaries, alongside other artists contributing to the pre-Pop art movement. At this time he was considered as an expressionist, which means he wanted to highlight people’s feelings in his works. Later, in 1963, he met Andy Warhol in New York, who influenced him to become an icon of British Pop Art. As a footnote, he was born with synesthesia, which basically means he had difficulties to distinguish colours. 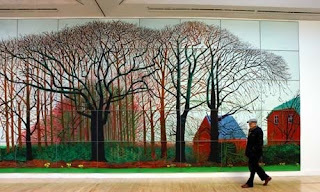 One of his biggest paintings is called bigger trees near water (40 feet wide by 15 feet). It represents a symbolic English landscape by using the technique of open air painting first used by the Impressionist Painters of the nineteenth century. To do so he painted during six consecutive weeks and had to finish it the arrival of spring which would have changed the landscape he wanted to draw. The result is a typical grey-looking landscape from his region: Yorkshire. He was inspired by a photographical technique he had used in his earlier works: the so-called “photo-joiner”. This term stands for various pictures taken from different angles in order to achieve a 360-degree representation of a single image. To represent things at their real-life dimension he painted to different parts apart before joining them together. The painting has been donated recently by Hockney to the York Art Gallery. 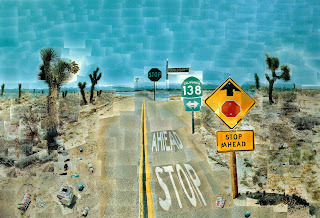 Hockney’s use of rich colours such as greens and blues is strongly shown in another famous painting: pearblossom Highway #2. This photo-collage uses juxtaposed pictures taken from different perspectives in order to achieve an unreal effect. This shows very well the effect of cubism which is strongly characterized by broken up objects re-assembled in an abstracted form. It is also a perfect example of Pop-Art work because it features elements of nature on one hand and elements of industrial culture (or mass consumption) on the other. The trees stand for nature while the filthy road symbolizes the drawbacks of culture. Objects such as the coke can shows this very well. In pearblossom Highway the artist made an interesting use of perspective: the stop signs mark the limit in distance of the perspective. Even though there is a second stop sign, the road continues.